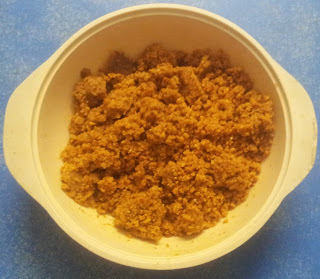 I'm going to follow the same template as yesterday's post of Molaga podi for this post, as most of the ingredients and procedure are the same. Take all the ingredients mentioned above, except the thenga (coconut) and fry it in a pan on medium flame with any oil that you prefer (I used refined sunflower oil) until both the paruppu turn golden yellow. Make sure to keep Sautéing it to avoid burning it. The chilli would also have started emitting its odour by now. Once done frying, keep this mix aside to cool down. Scrape the thenga fully and fry the scrapes on a dry pan until it loses its raw smell and becomes dry. Keep Sautéing it on the pan without any oil to avoid burning it. You will know if it is done from the change in texture. It should've come to a state where one strand(for the lack of a better term) doesn't stick to the other. This indicates that it is cooked. Remove the pan away from the fire. 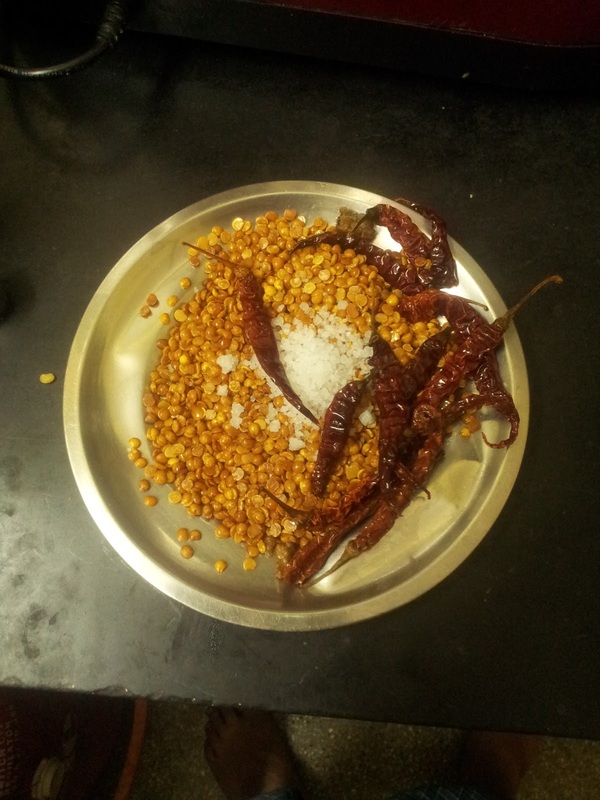 Now, take the previous mix of Red chillies, Thuvaram Paruppu, VeLLai ULundhu and asafoetida, after making sure that it has cooled down sufficiently for your mixer, grind it Rock-salt as necessary. (Rock salt lends a better taste than free-flowing powdered salt). Last step is to add the thenga that has been cooling down all this while to the already ground powder and grind them all together. 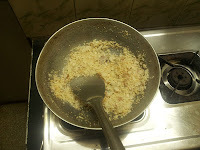 Almost the same procedure as that of MoLaga podi but instead of kadali paruppu, we use thuvaram paruppu. And instead of eLLu, we add the thenga. Next post - Dhaniya podi.